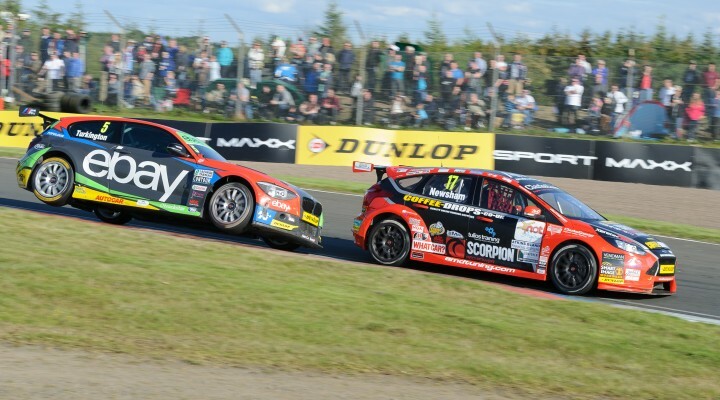 The AmDTuning.com team was able to celebrate a stunning breakthrough podium at Knockhill as the Dunlop MSA British Touring Car Championship headed to Scotland for the seventh event of the season. The West Thurrock-based team made the long journey north seeking to bounce back from a challenging weekend at Snetterton earlier in the month, where Inverness racer Dave Newsham had been restricted to just a single points scoring finish. Following a successful test session at Snetterton, the team headed for Knockhill in optimistic mood although the weekend started on a huge low following the news on Friday morning that Dave’s mother had passed away. Electing to race on in his home event, Dave qualified 16th on the grid at the wheel of his Ford Focus, with the possibility that he could have been higher had it not been for the fact that he just missed out starting on his final flying lap in the session as the chequered flag flew. A strong drive in race one saw Dave move through the pack to ninth place and, despite an issue with the tyre pressures on his car, went one place better in race two to secure eighth. That put him third on the grid for race three when the reverse grid draw took place and although he slipped back a place when the lights went out, a fine move at the hairpin on the third lap saw him move back into a podium position ahead of former champion Fabrizio Giovanardi. Fighting his way ahead of the BMW of Nick Foster into second place, Dave then came under increasing pressure from championship leader Colin Turkington before bringing his car to the finish for a first podium of the year. “I’m absolutely delighted to get a podium,” Dave said. “We’ve shown we have the pace on more than one occasion this season but for various reasons, we’ve never been in a position to really make it pay. Here, we did that in the first two races and then in race three, I was able to make two strong passes to get into second place and then just had to hold on. “Getting ahead of Fabrizio early on was key and then when I got through past Nick, I knew I had to push as hard as I could. Colin put me under huge pressure towards the end and I knew he was coming, but there was no way he was going to get through. Team boss Shaun Hollamby shared in the delight as his team secured a first podium since joining the series at the start of the 2010 campaign. “That is like a win for us; it tops everything that has come before,” he said. “This result stems from the work we did at the test at Snetterton and this weekend, the team has done a great job and Dave has been fantastic behind the wheel – especially in the circumstances. “His drive in race three was faultless. He was aggressive when he needed to be and then drove with his head. To see him bring the car home to the finish was just brilliant. This series has the highest level of competition in touring cars and for us to be fighting with a team like WSR for the result is a great achievement. I can recall watching Ayrton Senna winning in one of their cars in Formula 3, and now we’ve battled hard against them to secure our first podium.